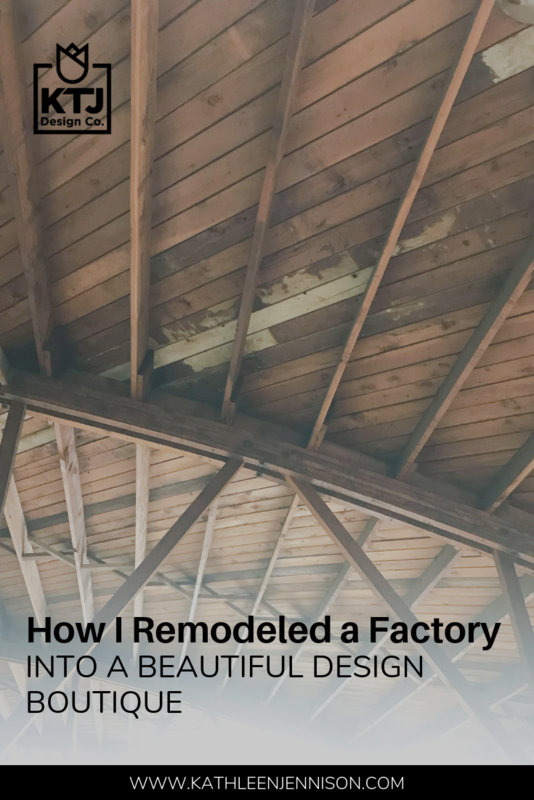 How I Remodeled a Factory into a Beautiful Design Boutique — KTJ Design Co.
For years, I‘ve wanted to own a boutique furniture store that offered a personal experience for my clients. After all, many of my clients said they wanted to sit on the furniture before they bought it… and you can’t do that online. · What do consumers want? · Who is my competition? · How would I structure my store? · What would be a good location for a unique destination home decor store? · Was difficult to find the perfect place? · Would I need / want to renovate? · How much space did I actually need? · How much inventory would I need to store? I knew what I was looking for – something so unique it proved difficult to find. I’ve always been fascinated by reclaimed buildings that start with one identity and become something else, like a library that becomes a restaurant or an old school house that becomes a boutique hotel. Fortunately, my husband found a place he thought I would like. He told me it was an old warehouse with brick walls and wooden beams. Perfect, he said. Lots of square footage, located downtown next to the ballpark. Yes, perfect! …but when I saw the building in person, I burst into tears. It was horrible! It had no windows, no electricity, and it was made of ugly cinder blocks that were definitely not bricks. I then learned it had been an old candy factory…and that my over-zealous husband had already signed the lease. I had always thought turning a dilapidated building into something modern and functional would be a blast. Ha! The enormity of the task was daunting. I wanted to crawl into a cave and hide forever. After having electricity installed, I added natural light to the building by replacing the industrial steel roll-up with a glass firehouse door. I also polished the concrete floors and refinished the old beams and trusses. The candy cooking room became the showroom kitchen, and the ugly little bathroom became a modern and attractive showroom bathroom. I then filled the space with beautiful furniture that I knew my customers would love. Each piece is in a price range they can afford and comes from high quality manufacturers I have grown to value and trust. The showroom features vignettes, all curated by our designers, which include furniture, rugs, décor, artwork, and more. With this in place, our customers can purchase a whole room or just a select few pieces, depending on their needs. Our Grand Opening is March 27th, but we’ve already welcomed our first customers. Each of them have said they don’t want to leave (a few have already returned for a second visit) as they are so charmed by the character of the building and the vignettes we have designed. Please join us for our open house (RSVP here), even if just to listen to the live music or appreciate the architecture. See you there!